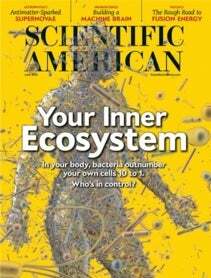 Biologists once thought that human beings were phys­iological islands, entirely capable of regulating their own internal workings. Our bodies made all the enzymes needed for breaking down food and using its nutrients to power and repair our tissues and organs. Signals from our own tissues dictated body states such as hunger or satiety. The specialized cells of our immune system taught themselves how to recognize and attack dangerous microbes—pathogens—while at the same time sparing our own tissues.